This plugin allows you to control whether images can be exported when only a Smart Preview is available. It can save you from unintentionally creating low-quality results when you didn't realize the master image file was not available. This plugin works in Adobe Lightroom Classic, and older versions as far back as Lightroom 5, though some features depend on the version of Lightroom). Note: the functionality provided by this plugin is already included in modern versions of my export plugins (for Flickr, SmugMug, Facebook, etc.) and also my Collection Publisher and Tree Publisher plugins, so you do not need this plugin when exporting via those plugins. Smart Previews, new in Lightroom 5, offer the flexibility of a raw workflow with minimal disk space, at the expense of image resolution and detail. A common workflow is to use Smart Previews for the rough develop when disk space is tight (such as to put one's 100,000-image “not-recent images” archive onto a laptop), then load in the master image files as needed for export. However, if you forget that an image's master file is not available, Lightroom will let you go ahead and export anyway, with possibly disastrous results as the low-resolution Smart Preview is used to generate a supposed-to-be-high-resolution copy. This plugin allows you to block exports that would use only a Smart Previews, aborting the export and singling out the images in question. However, sometimes a Smart Preview is perfectly adequate for an export, such as for a small copy for a blog post. The plugin can detect these situations and can optionally treat them differently. Toward the bottom of the dialog section is the configuration for the two cases outlined above: what to do when the export is “good enough”, and when it's not. 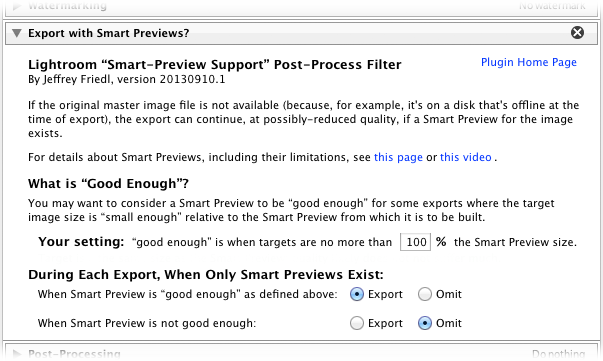 In the example above, “good enough” Smart-Preview exports continue, while other Smart-Preview exports are blocked. First, download the plugin using the link in the upper-right corner of this page, and unzip it to a location on disk where you'll keep it. Then follow the normal Lightroom plugin install instructions to install and enable the plugin in your copy of Lightroom. Then, bring up the Export Dialog, or for Publish, bring up the Publishing Manager. In either case, note the “Post-Process Actions” section in the lower-right of the dialog. “Post-Process Actions” are Adobe's name for what normal users might call “Export Filters”... the most popular of which are likely my Metadata Wrangler (for selectively stripping embedded metadata from exported images, for privacy) and Tim Armes' LR2/Mogrify watermarking-and-more plugin. 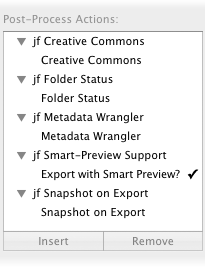 Double clicking on “Export with Smart Previews?” adds the plugin configuration section seen above to your dialog. For Export, you might want to save an Export Preset so that your settings are easy to recal with each export. With Publish, your settings are saved when you [Save] in the Publishing Manager. Clicking on the version number in the Plugin Manager now copies version info to the clipboard. Fix to get around a Mac display issue with Lr6 on OSX. Reworked the preview-to-export size computations... had some issues with rotated images. 20141019.16 Windows Only: Add a one-time check for the POODLE security vulnerability, and alert the user if it exists. 20140710.10 Sigh, had a bug in the Creative-Cloud support. 20140704.8 Sigh, introduced an error for some folks with the rebuild the other day. 20131002.4 When needing to bail on too many photos after the trial period expired, it complained on every extra photo instead of just once. 20130927.3 Address a plugin-load bug. Note: Lightroom must be restarted the first time after upgrading to this version from the previous version. Added "View Smart Preview in Explorer/Finder" menu item (under "File > Plugin Extras"), to show in Finder/Explorer the behind-the-scenes smart-preview DNG for the selected image. Also added an "Import Smart Previews Into Catalog" item, to bring those smart-preview DNGs into the catalog as their own unique, distinct images. This might be useful when you need to make a small print from a photo whose master image is not currently available. Could not create info sections for plug-in. You mention this plug-in is already “inside” export plug-ins for Facebook, Smugmug, etc. Does this “etc.”, include the export plug-in for Zenfolio? When exporting a landscape orientation shot, everything’s fine. the usual story: I accidentally deleted a whole series of pictures, emptied the trash and now just recovered small previews with your wonderful plugin for lighteroom. These are only very small files though: in fact, just one of those pictures, which I probably magnified in the catalogue as the file still existed, is 7MB! The rest is about 200 to 300 kb. What a pity. But, I just realised that the I also have the same catalogue in capture one express for sony (the files are .AWR from a Sony 7) and these previews are bigger! So now the question is: do you have an idea how to extract those bigger previews from the capture one catalogue? The bigger images are there…I just need to find a way to extract them as you did from Lightroom!